Featured Image: Ed Ruscha circa 1983. Courtesy of Joan Agajanian Quinn Archives. 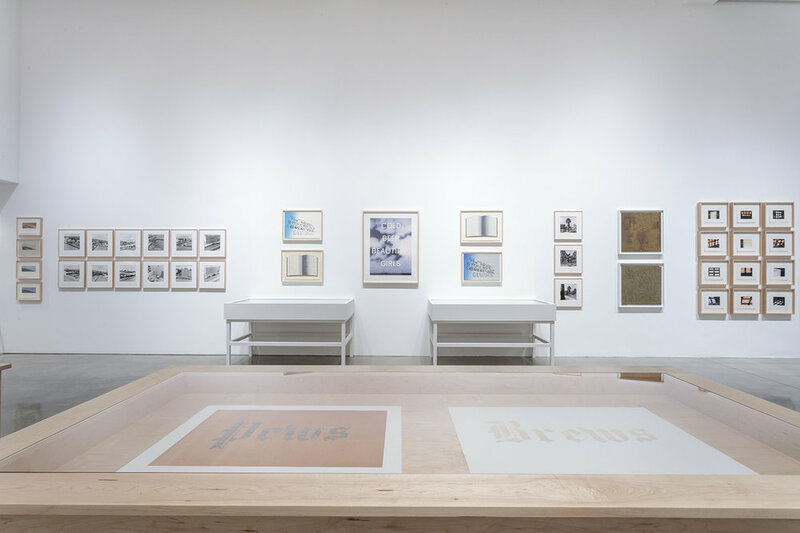 Ruscha's fantastic dual exhibition, Books & Co. and Prints and Photographs at Gagosian Gallery Beverly Hills closes on September 9th. Amanda caught up with Ed just in time. Amanda Quinn Olivar: What came first, prints, paintings or photography? Ed Ruscha: Photography, then painting then prints. Printmaking is more involved. AQO: Do the different disciplines influence each other? ER: They all look at each other and ask hard questions. AQO: What are some of the most unconventional materials you've worked with in printmaking? ER: Axle grease, caviar, tomato sauce and chocolate. Norman Lear's party, circa late 1970s. Clockwise from top left: Joe Goode, Ed Ruscha, Robert Graham, Jack Quinn. Courtesy of Joan Agajanian Quinn Archives. AQO: Your prints translate so well with the typefaces you use. How do you choose your typeface… do you experiment? ER: It’s an impulsive move every time - clumsiness plays its part somehow. AQO: What role does color play in your work? ER: I like colors that forgot that they were supposed to be colors, then I can settle back. AQO: Which of your peers influenced your work the most? AQO: Please relate a memory or two that influenced your life and/or career. ER: Along around age 50-something I got very scared when I learned I had vertebrae arthritis and had to have a spinal fusion operation. It put me on a different highway for awhile. AQO: What's your favorite art accident? ER: Misspelling the word “Hollywood”. All artworks © Ed Ruscha. Courtesy of the artist and Gagosian Gallery. Photography: Josh White/JWPictures.com. All artworks © Ed Ruscha. Courtesy of the artist and Gagosian Gallery. Photography: Jeff McLane. Courtesy of the artist. Photography: Aubrey Mayer. Ed Ruscha Books & Co. and Prints and Photographs at Gagosian Gallery Beverly Hills, July 28 - September 9, 2016.